I like this recipe because it's ultra easy. You throw the ingredients in a slow cooker, stir and wait for the morning. Overnight, the raisins and apple pieces soften and all of the flavors integrate. When you're ready to serve breakfast, toss in some walnuts and honey for the finishing touch and that's all there is too it. This recipe was submitted by a girl named 'DixieChick'. Her cooking time of 7 to 8 hours is spot on. I'd lean toward 7 hours which worked perfectly for me. Spray crockpot with nonstick cooking spray - unless otherwise indicated in your crockpot's instruction manual. Stir all ingredients together in the crockpot - EXCEPT for the walnuts and honey. Cook on low for 7 to 8 hours. Wake up. 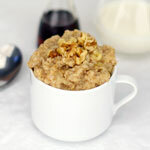 Stir in walnuts and honey and serve warm with a splash of milk and an extra sprinkle of brown sugar. Please note: This works great in my large 16-cup crockpot. 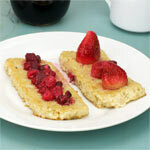 But when I've halved the recipe and made it in a smaller one, it scotched on the bottom. It's all about the low setting, because I know for a fact that my smaller crockpot cooks hotter than the other. 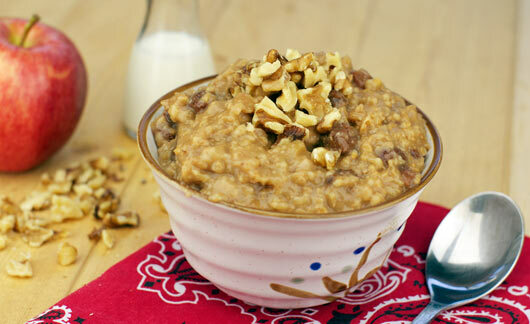 If your crockpot has every scorched anything on low, you may want to consider one of those two-hour recipes that use instant oats. Otherwise, enjoy! 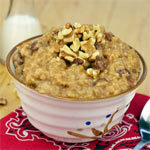 If you plan to sleep in, add an extra 1/3 cup of water for every hour over 8 that you leave the oatmeal unattended. It will help assure that the oatmeal isn't dry. 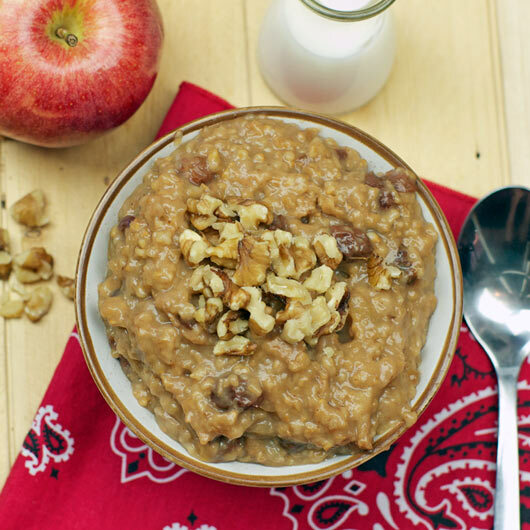 What do you think of Steel Cut Apple Oatmeal (Crockpot)? At 7 hours, it was perfect. 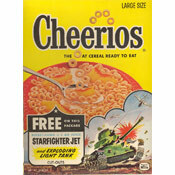 That's when I had breakfast. But then I left in on low heat for another hour and a half so my husband could have it later. But after that amount of time, the edges got crusty. It still tasted great, but didn't look as good. I'd say 7.5 hours is the perfect cooking time for this one. 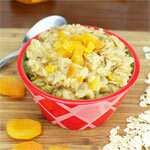 It was very tasty but maybe a little more mushy than when you make steel cut oats on the stove. The extra cooking time made it absorb the apple flavor.